Our Administrative Assistant, Cheryl Mercier, and her son, Tristan Parent, step-son to Michigan State Police Trooper Jason Mercier, is 15 and in a wheelchair with brittle bone disease. They applied to the Make-A-Wish Foundation for a chance to visit the Detroit Red Wings and Tristan’s wish was granted. This past Monday, they got their opportunity to go to the Joe Louis Arena to make the wish come true. The Red Wings sent a limo up to get them early in the morning and drove them all the way there, and dropped them off inside the arena. 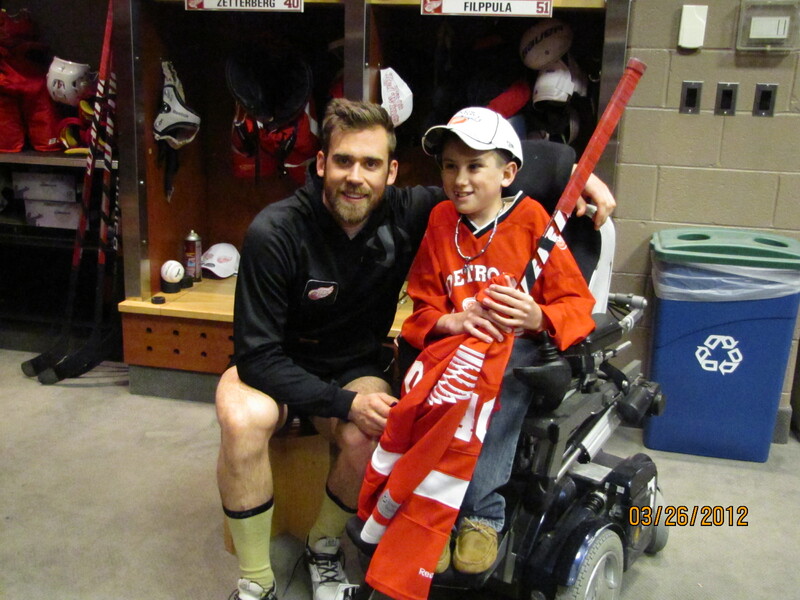 Henrik Zetterberg is his favorite player and got to meet him. He even gave him an autographed hockey stick. Henrik spent a good 30 minutes or so talking with him. Then they took him out on the ice and spent time with Todd Bertuzzi and his young son slapping pucks around. The goalie coach gave him a whistle and let him direct the goalie practice drills for awhile. Tristan spent about an hour out on the ice, in his wheel chair and got see the Red Wings morning skate. Tristan was even doing doughnuts on the ice in his wheelchair too! Then they brought him to the locker room where he spent more time with some of the players and talked hockey with him. They brought him out to the players tunnel and had a photo-op with him and many of the players, including Nicklas Lidstrom, Todd Bertuzzi, Drew Miller, Pavel Datsyuk, Jonathan Ericsson and Mickey Redmond. During the pre-game practice between the Red Wings and Blue Jackets, he (and his folks) got to sit in the penalty box and watch the practice. One of the Blue Jackets players flipped up a puck and gave it to him too. Just before the game, Coach Mike Babcock brought him into his office and showed him around, explained how he decides what lines to play and the different strategies he plays depending on the opponent that night. The Coach spent about an hour with him. Between the 2nd & 3rd periods, they did a special program with him that aired on TV. After the game, the limo took them all home. Tristan says no one is allowed to touch the hockey stick and even slept with it that night. The Detroit Red Wings organization & the Make-A-Wish Foundation are a class act all around. Here is the article and a video special they made.